Peptic ulcer disease and colitis both can cause stomach pain, and you may notice that certain foods seem to irritate your stomach more than others. Orange juice, because of its high acid levels, may bother you if you have ulcers or colitis. Therefore, you may want to drop orange juice from your diet. However, you should make sure to talk to your doctor first, especially if you have colitis, since patients with colitis frequently need the extra nutrition that a varied diet can provide. All fruits contain some acid, but citrus fruits fall on the very acidic side of the scale; oranges have a pH of about 2 to 3, making them potentially very irritating to someone with gastritis or peptic ulcer disease. In addition, colitis patients frequently mention that citrus fruits and juices, including orange juice, seem to cause or worsen their symptoms, again potentially because of the acid in them. Peptic ulcers, in which sores develop in the lining of your stomach or upper digestive tract, potentially affect about 20 million Americans, according to the University of Maryland Medical Center. They're not usually caused by the food you eat; instead, they're most often caused by a form of bacteria called Helicobacter pylori, or by too-frequent use of over-the-counter drugs such as ibuprofen. Generally, if you have peptic ulcers, you can avoid orange juice if you find it irritates your ulcer. However, you should make sure to replace it with another fruit or vegetable high in vitamin C.
Colitis affects your colon, not your stomach, but it also can involve the development of sores. Common symptoms of colitis include diarrhea, abdominal pain, weight loss and fatigue. 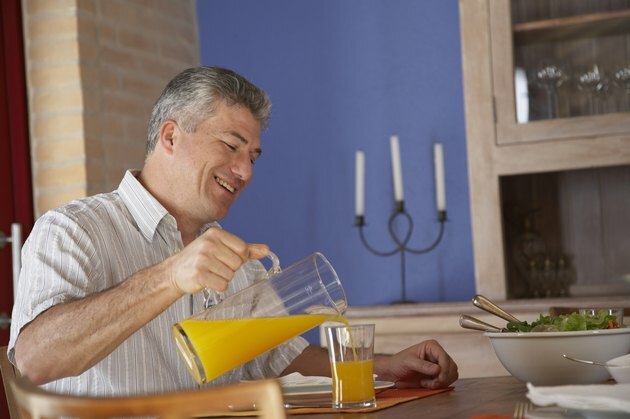 Many patients with colitis find that multiple foods, including orange juice and other fruit juices, bother them. However, you shouldn't restrict your diet when you have colitis. Many colitis patients are at high risk for malnutrition and for specific nutritional deficiencies, and they make the situation worse by limiting their diets in an effort to control their symptoms. Fortunately, both ulcer and colitis patients may have another option to keep orange juice in their diets: low-acid orange juice. Several orange juice manufacturers have developed versions of their products that are lower in acid, which might irritate ulcers and colitis less than the regular products. You should consider switching to low-acid orange juice before dropping orange juice completely from your diet. Also, check with your doctor to make certain you're getting enough vitamin C and other nutrients, especially if you've limited your consumption of orange juice because of your symptoms.